>> Top 5 Best Baby Car Mirrors Will Keep You Focused On Your Driving! There are times when you need to drive alone with your newborn like when your partner is in the office or just can’t travel with you. It’s during these times that you’ll find a baby car mirror really crucial. In this post, we’ll talk about the importance of being able to see your child while you’re driving and share with you five of the best baby car mirrors today. There are a lot of excellent baby car mirrors in the market today and how we wish we could include them all on our list. However, we want to make things easier for you by narrowing down the choices to five. 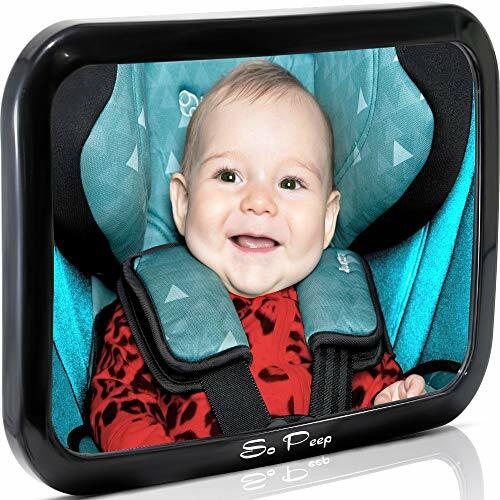 The So Peep car mirror is marketed as the largest baby car mirror. True enough, it’s the largest mirror on our list with a length of almost 12 inches. Engineered from high-quality materials, this mirror is made of a shatterproof acrylic glass that offers convex viewing. It comes with a dual strap system to keep the mirror secure when you're driving. 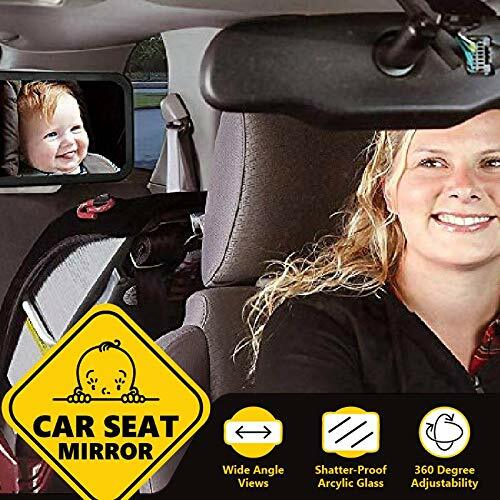 And for your convenience, this headrest mirror can be rotated to your desired angle, allowing you to have a perfect view of your child from head to toe. And if that’s not enough, you’ll also get an e-book valued at $4.95 for every purchase of this baby car mirror. The extra-large size of this mirror is more than enough for you to see how your baby is doing. It requires no assembly at all; you can use it straight out of the box. The double strap system does keep this mirror perfectly in place. Some parents may find the size a bit distracting. Baby car mirrors shouldn’t be a distraction, and that’s what Cozy Greens have to offer. It’s clear that the company has given much attention to detail with their product with safety as their number one priority. Their backseat mirror is a relief knowing that it has undergone strict crash testing in Europe. It has a shatter-proof surface that is guaranteed to last a lifetime, plus it comes with a secure strap system that will make sure the mirror stays in place. For an excellent view of your child while you’re driving, the mirror features a clear, convex-shaped surface and even provides a 360-degree view. As a bonus, the product comes with a first-aid kit and a specialized cleaning cloth for maintaining your mirror’s clear surface. This mirror doesn’t skew the image but gives an accurate view. You’ll love the fact that you can easily rotate it to your desired position. Attaching this to your car’s backseat requires zero effort. The rotation is very smooth so be careful not to hit it while taking your baby out of the car. 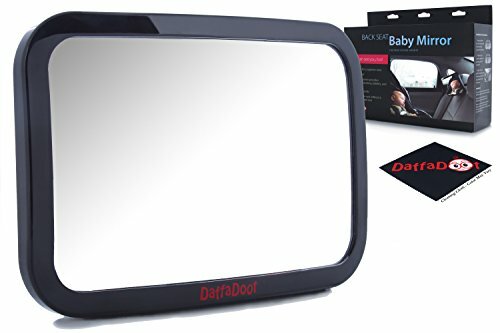 The DaffaDoot is one of the most versatile baby car mirrors around. Unlike most models of car mirrors, this one can be mounted both vertically and horizontally. What makes this model special is that it can be attached to a side headrest in case your car doesn’t have a center headrest in the backseat. And since it can be rotated at a 360-degree angle, you can adjust it so you’ll still be able to see your baby even if it’s mounted on the side. It’s totally safe for you and your baby, not only because it’s lightweight and shatterproof, but also because it’s free from Polycyclic Aromatic Hydrocarbon and Cadmium, which means it doesn’t release any plastic smell. It’s good to know you don’t necessarily have to install this mirror on the center headrest. It’s easy to position and stays where you put it. The frame doesn’t take up a lot of the mirror’s space, allowing you an excellent view. The straps tend to fall apart over time. It’s good to be able to clearly see how your child is doing at the backseat of your car while you’re driving and that’s just what the Sonilove baby car mirror allows you to do. This is a simple car mirror that’s effortless to install and straightforward to use. Just like most models of baby car mirrors, this one is made from acrylic glass that’s designed to be 100% safe and break resistant. This is a wide angle convex mirror and lets you have a full sight of your little one and his surroundings, so you can be assured that he’s safe, and you can focus on your driving. For a secure installation, the straps overlap each other and form a cross. And of course, the mirror can be rotated at any angle to provide you with the best view. This mirror is easy to adjust and doesn’t shake and move at all after installation. It’s a large mirror, but it’s just the right size and won’t obscure your vision. The mirror can be installed at either the right or left headrest if you’re not comfortable with having an object in front of your baby when he’s in the car. It sticks a bit far out from the headrest. This baby car mirror from Yes Baby is not just a mirror, but a gift bundle. Aside from a mirror, this set also comes with a cleaning cloth, plus a seatbelt strap cover. While the cloth is specially designed for cleaning dust and dirt, the strap cover helps prevent seatbelt strap irritation. Now, going back to the mirror, it’s a high-quality product made of shatterproof glass attached to a BPA-free reinforced ABS polymer plastic frame. It’s also 360-degree adjustable, allowing you to switch its position with ease. And finally, it features a secure strap system that’s tested and certified for you and your baby’s safety. This is a great set with a number of useful bonus items such as a pair of spoon and fork and a sign that says, “Baby on Board." The packaging and the instructions are cleverly presented, making this mirror the perfect gift. The mirror is very clear and provides an excellent view of your child. The strap may not be long enough for large headrests. 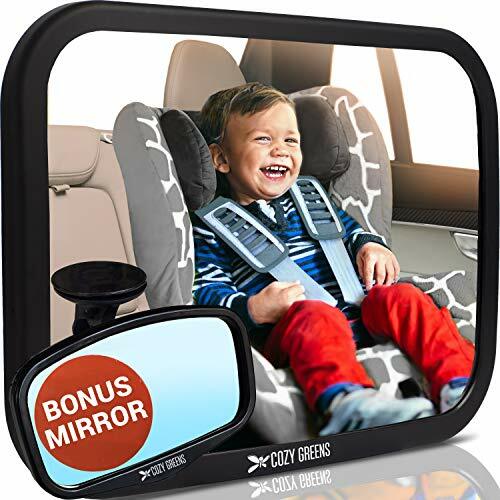 Based on the criteria we’ve set for the best baby car mirror, it seems that Cozy Greens Baby Car Mirror deserves our vote. First of all, it features a shatterproof glass that has undergone European testing. You know how strict the European standard is, so you can be sure of the quality of this car mirror. Not only that, but it also features a secure strap system that makes sure the mirror doesn’t shake or move when you're driving. The strap itself is made from durable black polymer and won’t easily break or disintegrate despite continuous exposure to extreme conditions. The mirror, on the other hand, is a convex-shaped surface, which means it can provide you a wide view without having to take space itself. Most importantly, it’s lightweight and can be adjusted to any angle, allowing you to position it any way you want that’s convenient for you and your baby. Is A Baby Car Mirror Necessary? Experts recommend that children under the age of two should be kept in a rear-facing car seat. According to studies, this lowers the risk of them dying or getting injured in case of an accident by up to 75%. In fact, keeping your child in a rear-facing seat when you’re traveling will make him five times safer than when you don’t. The only challenge thing that many parents find about this idea is that it makes them anxious as to how their children are doing since they are facing the rear of the car. This is where the baby car mirror comes in. With a car mirror, you’ll be able to observe your baby while you’re driving and make sure he’s okay. Some camps find baby car mirrors to be effective in helping relieve parents of anxiety and let them focus on their driving. Others, on the other hand, find such devices to be distracting, claiming that the presence of a mirror keeps the focus of the driver on the baby and off the road. Reassurance. Most children only develop the understanding of object permanence once they reach two years old. For them, objects no longer continue to exist when they cannot be observed. When they’re in a rear-facing car seat and are not seeing your face, they will think that you’re not there with them unless you keep talking to them. Placing a mirror on the headrest of the backseat will let them see your face, assuring them that you are right there in the car with them. At the same time, being able to see your child in the mirror gives you the assurance that he’s doing just fine and help you drive more relaxed and with peace of mind. Social Skills. Babies don’t recognize themselves in the mirror until they’re 15 months old. This has been proven by an experiment called the “rouge test.” Until then, allowing your child to see his reflection can help him develop social skills, or perhaps reach some sort of self-awareness. Visual Tracking Skills. Visual tracking is a baby’s ability to follow a moving object with his eyes. Even though he’s not able to recognize his face in the mirror, his reflection is a good visual stimulation and can significantly help in developing his vision. And according to studies, visual tracking development greatly helps in cortical development. Shatter Proof. A mirror is a mirror, and it’s going to break with the right amount of impact. However, some materials used in baby car mirrors are stronger than others. When shopping for a mirror for your vehicle, pick one that’s made of a shatterproof material such as acrylic. It may still break due to high impact, but it’s not going to shatter as a glass would. Secure Installation. Most models of baby car mirrors are designed to suit only those cars with headrests in the backseat. It’s a good thing there are newer models now that do not have this requirement. Aside from that, you should also put into consideration the way the mirror is going to be installed. For safety, find a model that’s designed not to shake or fall due to strong vibration. Wide Angle. 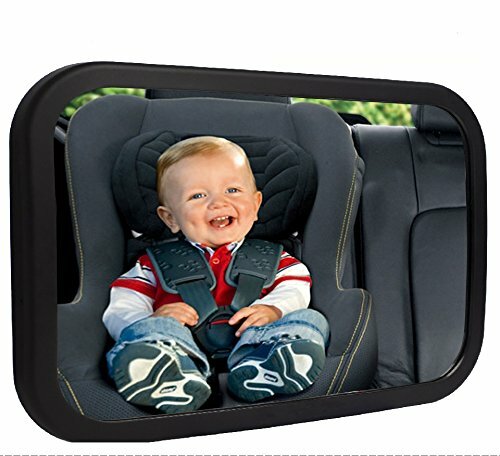 A good baby car mirror is one that allows you to view your child from head to toe. Choose a model that can provide you with a wide angle of view. A convex-shaped mirror usually lets you achieve this. Space Saver. You would want to see your child completely in his car mirror and that without the mirror taking a lot of space. Again, a mirror with a wide angle will help you do this. That’s it for our pick of the best baby car mirrors. We hope you found this post helpful in your quest of looking for the perfect car mirror for your little one. And if you did, don’t think twice of sharing this so your loved ones may also know. Thank you!